Conduct a visual inspection for anything that may cause a hazard during testing or affect proper operation or resetting. Mounting and assembly bolts are not missing or loose. Welds and weld location comply with installation method for fire door assemblies welded to steel jambs per manufacturer’s installation instructions. Fusible links are located per manufacturer’s instructions. Guide assemblies have the required fire expansion clearance per manufacturer’s instructions. Slats – bent: tears or holes; metal fatigue. Endlocks – missing; broken; bent; loose. Bottom Bar – bents angles; loose bolts. Guide Assembly – bent angles or channels; loose bolts; curtain entry misalignment. Hood (and Flame Baffle when required) or Fascia – bent; rubbing curtain; holes; loose fasteners; metal fatigue; missing intermediate supports (when required). 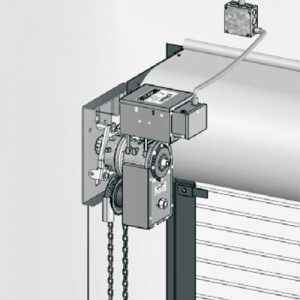 Automatic Closing Mechanism – missing, broken parts; drop or release arms tied, blocked or wedged. Operating Mechanism – worn, misaligned or poorly meshed gears; worn roller chains; misaligned or loose sprockets; loose bearings; broken parts; bent shafts. Open and close the door using normal operation. 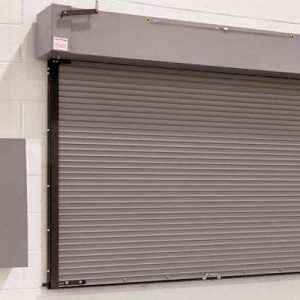 If you find the door is not properly balanced, or there is damage or missing parts that may create a hazard or prevent proper operation, have these conditions corrected before conducting a drop test. A drop test is required to confirm that the fire door will close automatically during a fire emergency. Use manufacturer’s drop test instructions. Door must be fully open before drop test. The door must close fully so the bottom bar rests o the sill. The average closing speed must be between 6″ and 24″ per second. 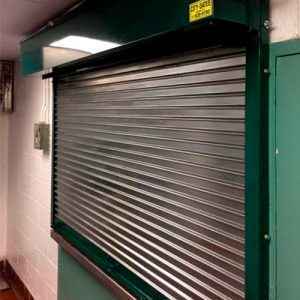 Test each automatic closing option for the fire door. Reset the door per manufacturer’s instructions. Open and close the door by normal operation, add tension back to spring. Drop test the door a second time, add tension back to spring and reset again. 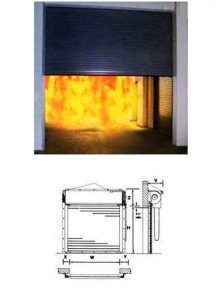 Ultimate acceptance of a fire door is the decision of the authority having jurisdiction, as defined in NFPA 80.